UWIN faculty member Dr. Bing Brunton has been awarded a 2019 multidisciplinary university research initiative (MURI) award from the Air Force Office of Scientific Research! The MURI program supports teams of investigators from different fields to facilitate the growth of newly emerging technologies. Dr. Brunton’s awarded project focuses on sparse sensing and control for agile flight, and combines the efforts of researchers from the University of Washington, Carnegie Mellon University, and the Massachusetts Institute of Technology. These researchers include UWIN faculty members, Tom Daniel, Steve Brunton, and Nathan Kutz, as well as Sarah Bergbreiter from Carnegie Mellon, and Jonathan How from MIT. The focus of this research is on the ability of flying animals to acquire information about the environment and make tiny adjustments with small amounts of data. The researchers look to mimic this ability in algorithms and robotics. Many flying animals have strict constraints on size, weight, and computing power, but can still make precise adjustments with large amounts of environmental data. Brunton is looking to use inspiration from flying animals to work on the flying ability in tiny robots by reducing the amount of data imputed through use of specialized hardware alongside sparse neuronal computations. By investigating the flight constraints and the neural response, the project strives to have broad impacts in designing efficient sensor networks, performing adaptive control of complex systems, and achieving agile flight sensing and control. Bing Brunton previously received an Air Force Office of Scientific Research (AFOSR) Young Investigator award as well as a University of Washington Innovation award. Steve Brunton has received an Air Force Office of Scientific Research (AFOSR) Young Investigator award alongside two College of Engineering awards – one in 2018 and one in 2017. Sarah Bergbreiter has received a Presidential Early Career Award for Scientists and Engineers (PECASE) Award in 2013 for her research on engineering robotic systems down to sub-millimeter size scales. This award was also written up in UW Biology’s newsletter. 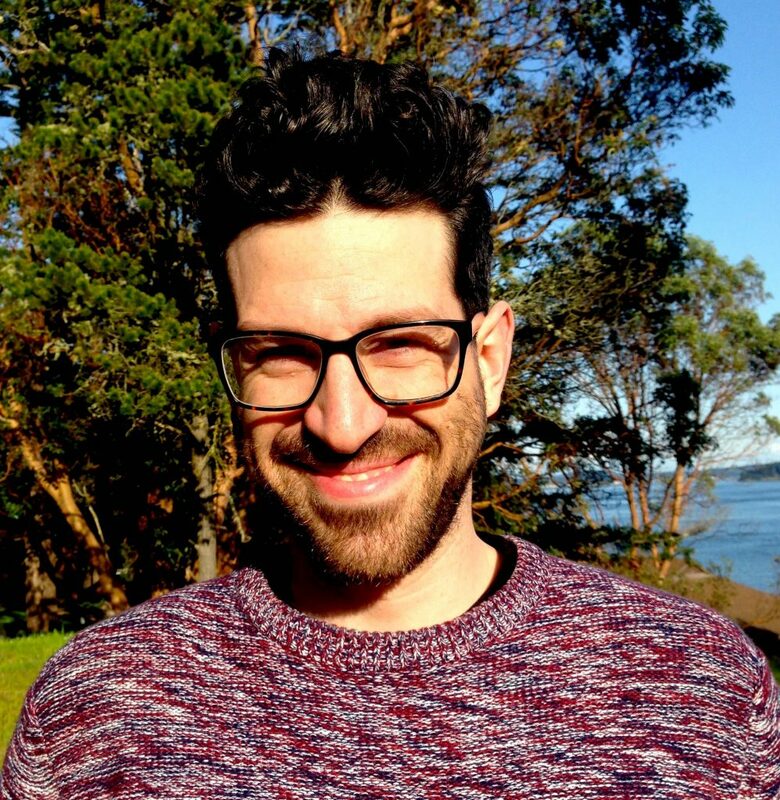 Bing Brunton, a Washington Research Foundation Innovation Assistant Professor and UWIN faculty member in Neuroengineering, was featured in a recent College of Arts and Sciences newsletter. The article, titled “What Insects can Teach us about Data,” was published in March of 2019. Brunton researches the ability of flying insects to make tiny but critical adjustments with small amounts of data. She is specifically working to develop a sparse sensor algorithm to mimic sensors on the wings of a hawk moth. These tiny mechanoreceptor neurons on the moth wings allow the moth to track environmental impacts such as wind and adjust the wings accordingly. By understanding how the these neurons are able to take in data, process it, and produce micro-adjustments in real time, Brunton hopes to determine how to mimic this process artificially. Dr. Bing Brunton has been previously featured in a College of Arts and Sciences article in September of 2016 about her work to analyze large sets of neural data. She has also been recently awarded a highly competitive multidisciplinary university research initiative (MURI) award from the Department of Defense. 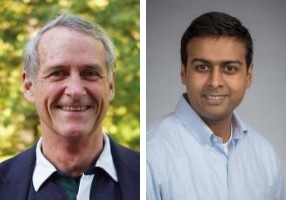 The April 2019 UWIN seminar series continues with a pair of short talks by Eberhard Fetz and Ramkumar Sabesan. The seminar is on Wednesday, April 10, 2019 at 3:30 in Husky Union Building (HUB) 337. Refreshments will be served prior to the talks. Changes in cortical connectivity have been induced in awake behaving monkeys with head-fixed bidirectional brain-computer interfaces. This talk will discuss results from three experimental protocols that have been modeled: spike-triggered and cycle-triggered stimulation and paired-pulse stimulation. Conditioning results were simulated for the first with an analytical statistical model and for all three with an integrate-and-fire spiking network model. The visual system reconstructs fine spatial detail and rich color experience from a paucity of wavelength and intensity signals originating in the cone mosaic. We use a combination of adaptive optics and high speed eye-tracking to allow light stimuli of multiple wavelengths to be targeted on individual cones. Consequently, visual perception upon controlled activation of a single or a group of cones can be addressed in a living human yielding psychophysical measures ultimately limited by the cone mosaic and downstream retinal and cortical circuitry. I will describe results from a recent set of experiments aimed at outlining the spatial characteristics of color appearance and conclude by framing these results in relation to contemporary models of neural circuitry mediating color and spatial vision. 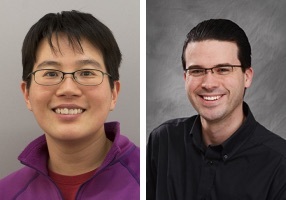 The March 2019 UWIN seminar series continues in March with an exciting pair of short talks by Wu-Jung Lee and Eric Rombokas. The seminar is on Wednesday, March 13, 2019 at 3:30 in Husky Union Building (HUB) 337. Refreshments will be served prior to the talks. The biosonar systems of echo-locating bats and dolphins possess accuracy and efficiency unmatched by human-made sonars. Echolocation is an adaptive process that involves transmitting probing signals and analyzing returning echoes to make decisions about the next set of behaviors. Yet, only until recently have elements of this closed-loop feedback process been considered in a holistic manner in experimental and theoretical studies. In this talk I will discuss the significance of each element of the echolocation feedback and my ongoing work in modeling echolocation-based target search behavior using the infotaxis principle originally developed for odor source localization. I will describe three topics we’re working on, providing humans novel sensory stimuli using noninvasive devices. The first is a vibrotactile sensory feedback array that allows people to better estimate their foot (ski boot or prosthetic lower limb) placement on stairs. This will include some early results we’ve observed about sensory capabilities after lower-limb Targeted Reinnervation sugery. The second is a series of visuo-tactile integration experiments in which we experimentally induce spatial conflict in the cues, a sort of “visuotactile 2-point discrimination test.” Finally I’ll describe a body ownership illusion over a virtual reality body during an exciting “stabbing knife game.” We’re exploring the behavioral consequences, as opposed to subjective responses or physiological signals, to feeling these illusions. 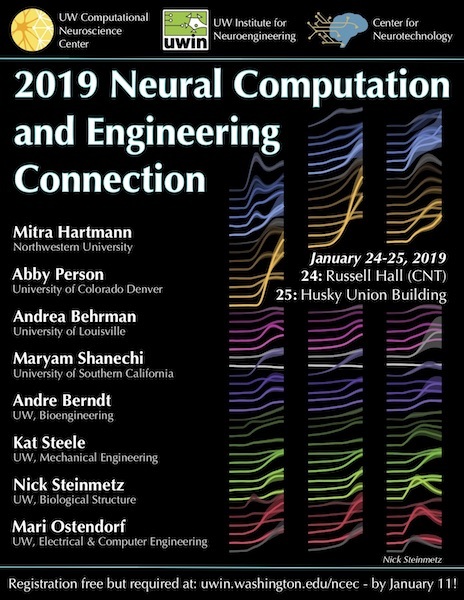 The 2019 Neural Computation and Engineering Connection (NCEC) was held on January 24-25, 2019. 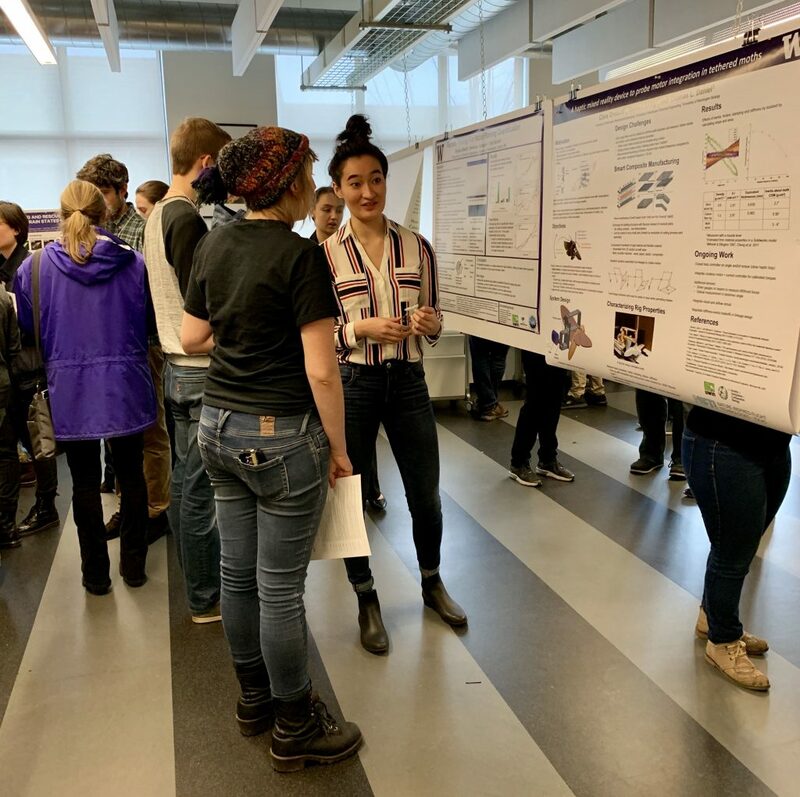 This annual event brings together the UW neuroengineeirng and computational neuroscience communities to share and discuss new research and facilitate collaborations. The event is sponsored annually by the UW Institute of Neuroengineering (UWIN), the Center for Neurotechonolgy (CNT), and the UW Computational Neuroscience Center. 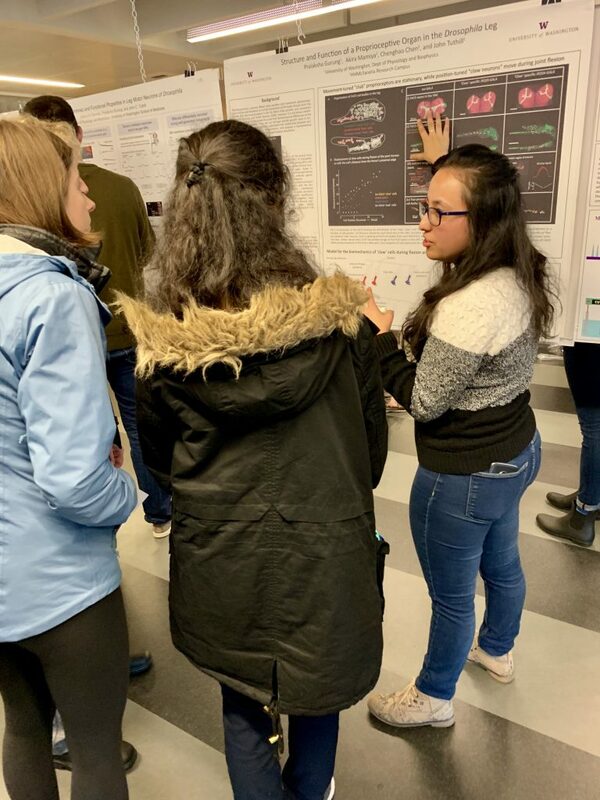 This year’s connection drew 160 attendees, with a multitude of talks: four by invited keynote lecturers, four from local UWIN faculty, three talks by senior UWIN/Swartz postdoctoral fellows, and seven talks by senior UWIN and Computational Neuroscience graduate students. Alongside these talks, there were a series of lightning talks by new graduate students and postdoctoral fellows, a poster session, and an ethics panel. Thank you to all who attended and participated! Day 1 of NCEC kicked off with a poster session over lunch! 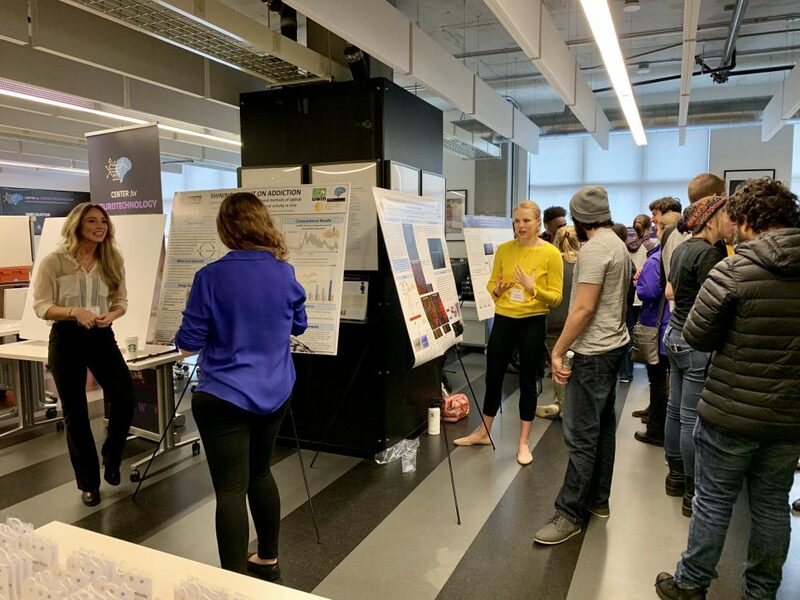 UW faculty members and students presented their work on a variety of neural engineering and computational neuroscience topics. Yamagami looks to improve treatment of individuals with neurologic injury by analyzing how predictive (feedforward) and reactive (feedback) controllers change as individuals perform a manual trajectory tracking task. Rice investigates how learning and behavior in target discrimination tasks can be improved through the use of noninvasive neuromodulation of various event-related potentials, such as error- and feedback- related negativity. With this investigation in progress, plans were discussed to apply this research to deeper cortical regions of the brain through trans-cranial magnetic stimulation. Sanchez addresses issues with manual long-term sleeps studies, which are often time-consuming and error-prone, by working to develop sleep-stage classification algorithms that can parse the stages of rest. The algorithm currently can detect REM sleep well, and is continuing to be worked on with an increased training set size. Shi’s goal is to predict single neuron responses through an artificial neural network and to compare the responses that occur in a mouse’s visual cortex, in hopes of gaining insights into how the mouse visual cortex processes natural visual stimuli. Yucel looks to discover the experiences of retinal prostheses patients through a series of manipulations of stimulation protocols, in the process solidifying a few problems in creating reproduceable percepts. One of these problems revolves around differences in retinal structure which causes variation in electrode stimulation, producing a variety of different shapes which are inconsistent from patient to patient. Tariq works to study how dynamically varying odor flow guides decision making in animals who rely on odor as a method of navigation. He uses a network of low-cost, lightweight sensors to monitor olfactory information in real time, which is then combined with behavioral tracking of animals. Garcia expands the investigation of simultaneous neural firing from rodents to primates in an attempt to determine the mechanisms of memory formation and navigation in primates. This effort revolves around applying non-traditional analysis methods on recorded local field potential from the primate hippocampus. In the first keynote lecture, Berhman investigates the status of neurotherapeutic interventions and how the current state of therapies based on activity-dependent plasticity has altered the trajectory of outcomes with acquired spinal cord injuries. By using locomotion training with patients, even if the patient cannot make certain movements voluntarily, the neuromuscular system can learn the correct motor patterns and the spinal cord nerves can learn to fire to encourage voluntary movement. These interventions can decrease scoliosis severity, improve respiratory function, improve ability to sit, and improve trunk control, and with continued research can perhaps reach even further. Day 1 ended with a discussion on the topic of “what are our responsibilities as scientists at the interface of neuroscience, computation, and engineering?” The panel covered many different points including managing data and protecting patient privacy, considering the place neurointerventions have in society, as well as the separation between restoring function and enhancing function. Panel Speakers (left to right): Mitra Hartmann, Andrea Behrman, Eric Shea-Brown, Abby Person, Maryam Shanechi, Michael Berry, David Perkel, Loren Frank. Panel chair (not pictured): Adrienne Fairhall. Shanechi works to model and decode mood variations in an effort to create future closed loop therapies which would have the ability to read the brains signal, encode this bio-signal to an electrical one, provide some electrical stimulation as input, and continue to self-modulate to monitor and manage mood. Her current investigations work with creating a model to characterize the bio-signal output by the brain as well as to identify the locations in the brain that are most predictive of mood. Berndt designs a new method of optimizing new sensor proteins in order to streamline a resource and time-intensive task of creating tools that have the potential to provide data at high spatial and temporal resolution. Through a recursive high throughput method consisting of random mutagenesis, ensuring individual sensor expression, screening in microarrays, and DNA sequencing of the best performing sensor, Berndt believes the creation of these sensor proteins will be more efficient. Ostendorf looks to transfer the fluid language adaptation of humans to computational modeling of language through the incorporation of modified variables into the neural network model of language. These variables include changing discrete variables to continuous, allowing for words to be related to each other and characterize similarity easier, as well as various methods of a weighted variable of bias, which allows for multiple contexts to be considered at once. Libby works to improve robotics through incorporating the understanding of animal’s complex interactions between behavior and morphology. He emphasizes multi-functionality exhibited in animals and emphasized the need for multi-functionality in robotics in order to reduce the need for isolated movements and highly calculated encounters. Steel examines whether altered motor control limits potential improvements in movement patterns of individuals with cerebral palsy and the implications for their clinical care. Using a simulation model which displays optimal gait for varied synergy levels – varying the ability to co-activate certain muscle groups and display fine motor control – which at the lowest levels optimized to movement patterns similar to those in individuals with cerebral palsy. The lowered synergy levels lowers the ceiling on recovery as even after surgery and rehabilitation, synergy spaces is hard to modify, although in the future, therapy may focus specifically on expanding synergy space. Person investigates how cerebellar damage leads to dysmetric movement through experiments defining the relationship between cerebellar activity and limb reaching movement in freely behaving mice. The experimentation supports the idea that the signaling by Purkinje neurons are used for the feedforward control of the reaching limb. 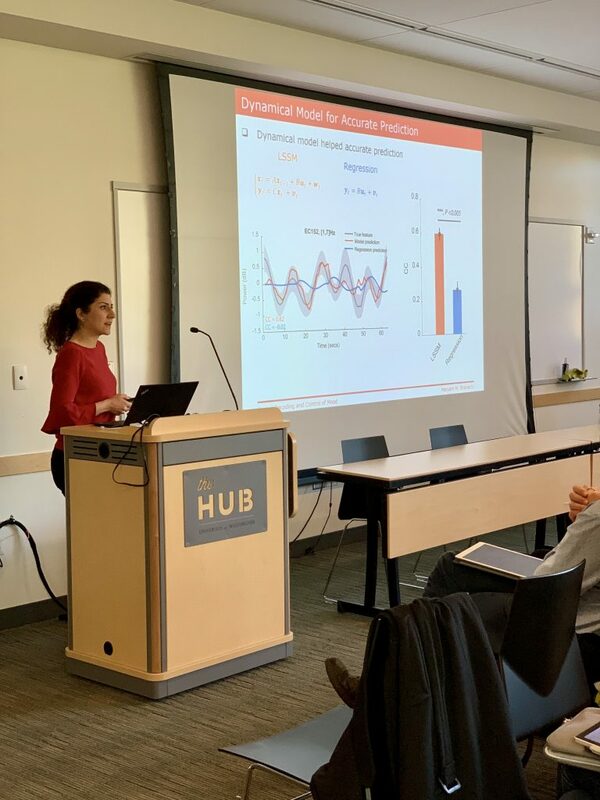 Recanatesi looks at ability of recent neural networks to solve sequential processing tasks using predictive modeling and uses a recurrent artificial neural network model to investigate if the ability of the hippocampus to guide sequential planning. The recurrent neural network was trained with predictive learning on a simulated spatial navigation task and resulted in a series of nonlinearly modified inputs which captured the structure of the environment, highlighting the predictive aspect of neural representations. 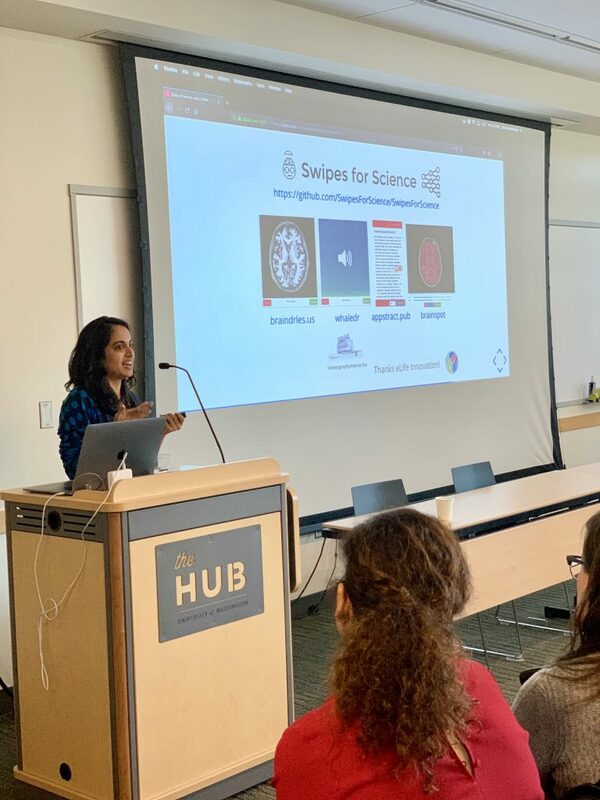 Keshavan addresses the difficulties that have arisen from advances in technology allowing massive amounts of data to be collected, and proposes how using web technology can help neuroscientists manage the big data challenge. Through the use of web-based visualization, collaborative meta-analysis, and citizen science platforms, scientists can address challenges of high data dimensionality, integrating a seemingly endless stream of new results into literature, and scaling decisions made by neuroimaging experts to large data sets. Steinmetz presents recent work studying the neural mechanism of visually-guided behavior in mice by using Neuropixels probes to record the activity of 30,000 neurons over 42 brain regions while mice performed a vision-based behavior task. The work provides a new view on the neural population, showing how neurons in different regions respond differently when making decisions as opposed to when responding to purely visual signals, as well as highlighting how all brain regions are active and working together to respond to a stimulus. Hartmann studies the use of animal vibrissae (whiskers) in order to sense fluid flow in their environment, and works on applying biological insight to the design of artificial whiskers for tactile and flow sensing. These insights have led to mechanical analysis that also is applied to guide neurophysical experiments in hopes of better understanding both the neuroscience and mechanics of whisker-based sensing. 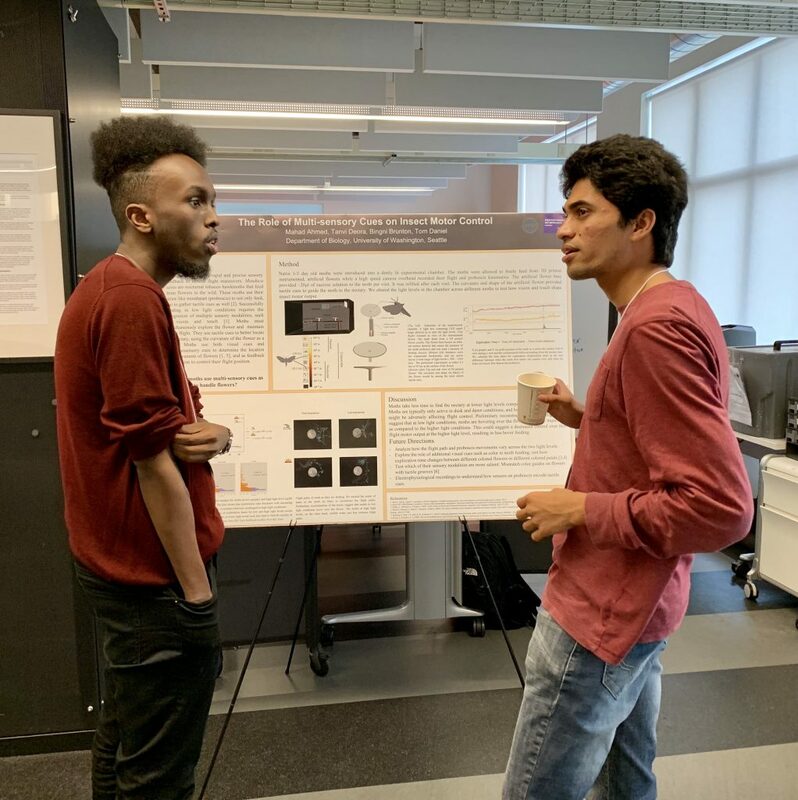 Applications are now open for the 2019 WRF Innovation Undergraduate and Post-baccalaureate Fellowships in Neuroengineering. Applications are due by Monday, March 4, 2019. The first UWIN seminar of 2019 features a talk by visiting speaker Guillaume Lajoie from Université de Montréal’s Department of Mathematics and Statistics. The talk is titled “Successful learning in artificial networks thanks to individual neuron failure”. 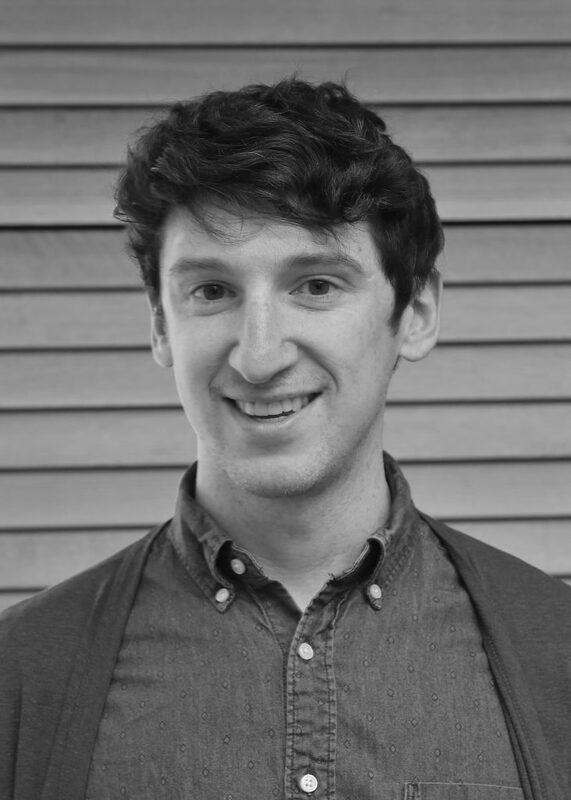 Guillaume is an Assistant Professor in the Department of Mathematics and Statistics at the Université de Montréal, and is also an Associate Member of Mila, the Quebec Institute for Learning Algorithms. We are especially excited to welcome Guillaume back to UW as he was previously a UWIN postdoctoral fellow! The seminar is on Wednesday, January 9, 2019 at 3:30 in Husky Union Building (HUB) 337. Refreshments will be served prior to the talk. This talk will outline work in progress. Not unlike the brain, artificial neural networks can learn complex computations by extracting information from several examples of a task. Typically, this is achieved by adjusting the parameters of the network in order to minimize a loss function via gradient descent methods. It is known that introducing artificial failure of single neurons during a deep network’s training, a procedure known as dropout, helps promote robustness. While dropout methods and variants thereof have been successfully employed in a variety of contexts, their effect is not entirely understood, and relies on stochastic processes to select which units to drop. Here, I will discuss two methods designed to purposely select which units would best benefit learning if dropped or temporarily modified, based on their tuning, activation and the current network state: The first method is aimed at improving generalization in deep networks, and the second combats gradient exploding and vanishing in recurrent networks, when learning long-range temporal relations. While gradient descent methods for artificial networks are not biologically plausible, I will discuss how relationships between neural tuning and failure during training can inform exploration of learning mechanisms in the brain. Registration is open for the 2019 Neural Computation and Engineering Connection (NCEC)! It will be held on the afternoon of Thursday, January 24, 2019 and all day Friday, January 25, 2019. NCEC brings together the University of Washington neuroengineering and computational neuroscience communities in an exciting and stimulating event! This event is sponsored by the UW Institute for Neuroengineering (UWIN), the UW Computational Neuroscience Center, and the Center for Neurotechnology. The keynote speakers for NCEC 2019 are: Mitra Hartmann (Northwestern), Abby Person (University of Colorado Denver), Andrea Behrman (University of Louisville), and Maryam Shanechi (University of Southern California). Local speakers include: Andre Berndt (UW Bioengineering), Kat Steele (UW Mechanical Engineering), Nick Steinmetz (UW Biological Structure), and Mari Ostendorf (UW Electrical & Computer Engineering). UWIN and Computational Neuroscience graduate and postdoctoral fellows will also be giving talks. Registration closes on Friday, January 11, 2019. 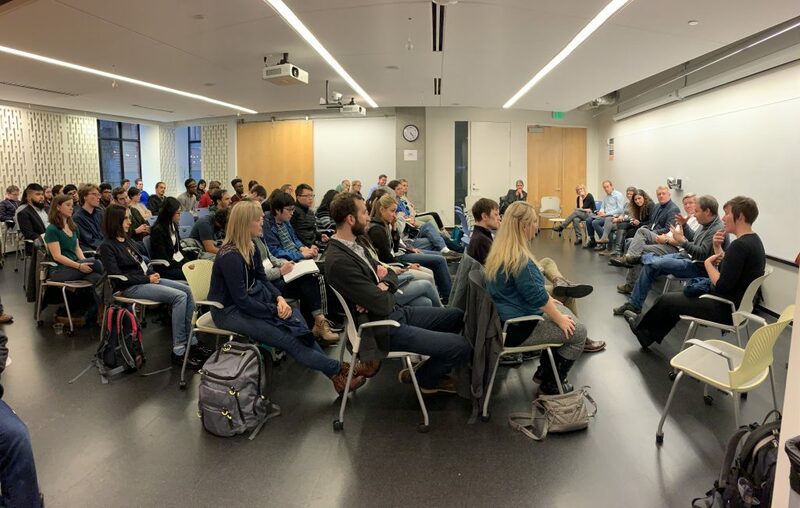 Thursday’s events will be at the Center for Neurotechnology (Russell Hall Suite 204, 1414 NE 42nd St.), starting with a poster session during lunch, followed by student talks, a keynote lecture by Andrea Behrman, and a panel discussion on ethics in neuroscience. Friday’s events will be all-day at the Husky Union Building (HUB) room 334, including keynote talks by Mitra Hartmann, Abby Person, and Maryam Shanechi, talks by UW faculty Andre Berndt, Kat Steele, Nick Steinmetz, and Mari Ostendorf, and talks by senior UWIN and Swartz postdoctoral fellows. NCEC will end with a late afternoon reception on Friday in HUB 332. 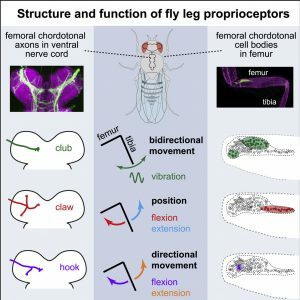 UWIN faculty member John Tuthill and UWIN-post baccalaureate fellow Pralaksha Gurung published a paper in Neuron on how sensory neurons in a single leg joint in Drosophila (a genus of flies often lumped together as “small fruit flies”) code movements and control behavior in that joint. 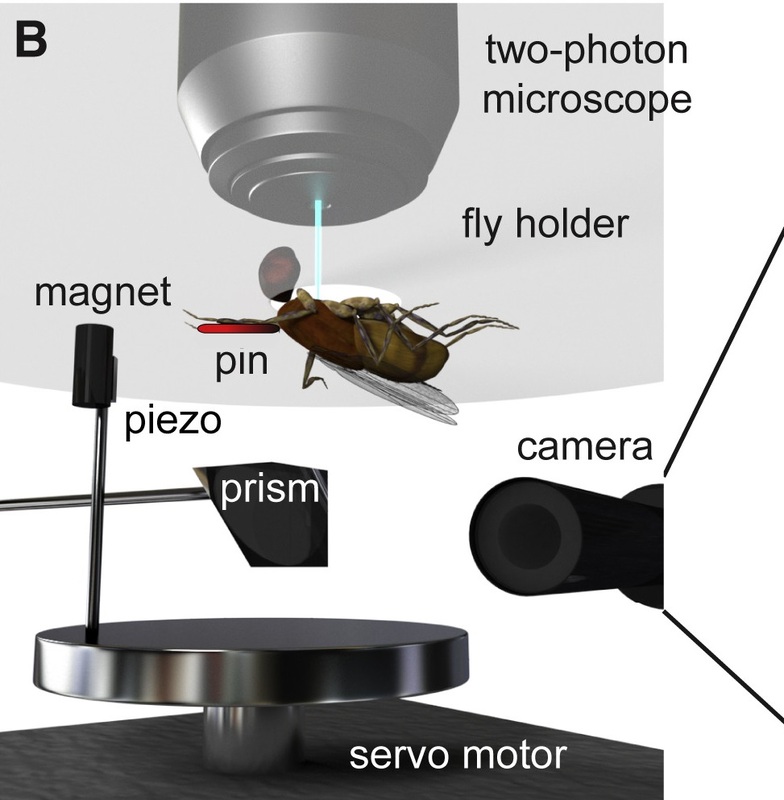 The paper titled “Neural Coding of Leg Proprioception in Drosophila” describes the work using fluorescent dye-based two-photon calcium imaging to isolate and investigate these specific sensory neurons. In order to move, nearly all mobile animals rely on receptors that specialize in position and movement called proprioceptors. Challenges arise in modeling and analyzing proprioceptors due to complications in isolating the specific clusters of receptors and relating them across individuals in a species. 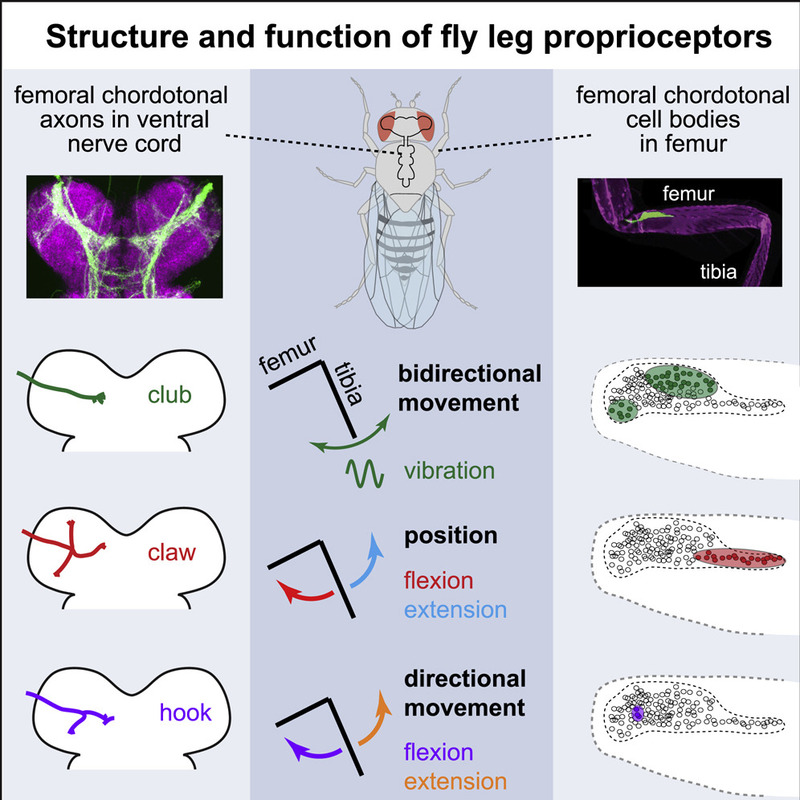 These challenges were addressed in this paper by focusing on a specific proprioceptor group within the leg of the fruit fly – which previous research had marked as controlling precise leg movements, such as walking. In order to isolate the specific proprioceptor, a magnet and pin glued onto the fly’s tibia controlled the fly’s leg position. 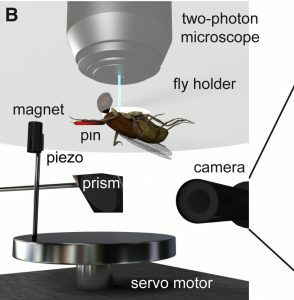 By measuring neuron activity during the fly’s range of leg movements, the researchers found the sub-classes of neurons that responded to different positions of the joint, as well as the neuron’s sensitivity to movements. The isolation and mapping of the cluster of neurons provides more insight into how proprioceptors aid in everyday motion. This work helps build an understanding of how stimulation of a single leg joint is received and translated by sensory neurons, and also builds a framework for how complex feedback signals are used in the body to dictate movement. This work connects with the mission of the Air Force Center of Excellence on Nature-Inspired Flight Technologies and Ideas (NIFTI). Previously, Dr. Tuthill won a 2018 McKnight Scholars award, was named a 2017 Allen Institute Next Generation Leader, was awarded a Sloan Fellowship, was named a 2017 Searle Scholar, and received a UW Innovation Award.